Today’s intake of food was very similar to yesterday. 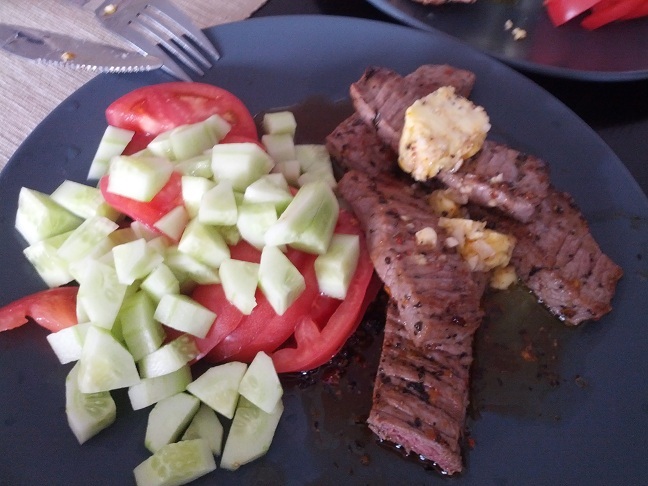 Focus is on meat, fat from butter and olive oil and some vegetables on the side. Started the day with just a cup of coffee. No need for any additional food before lunch today. Started to feel a little hungry around 13.00 so cooked up some lunch then. Today’s lunch consisted of same type of food that I had for lunch yesterday. I really like this meal and could eat it every day. The only thing I change with it is if I have garlic butter with it or just some kind of sauce. 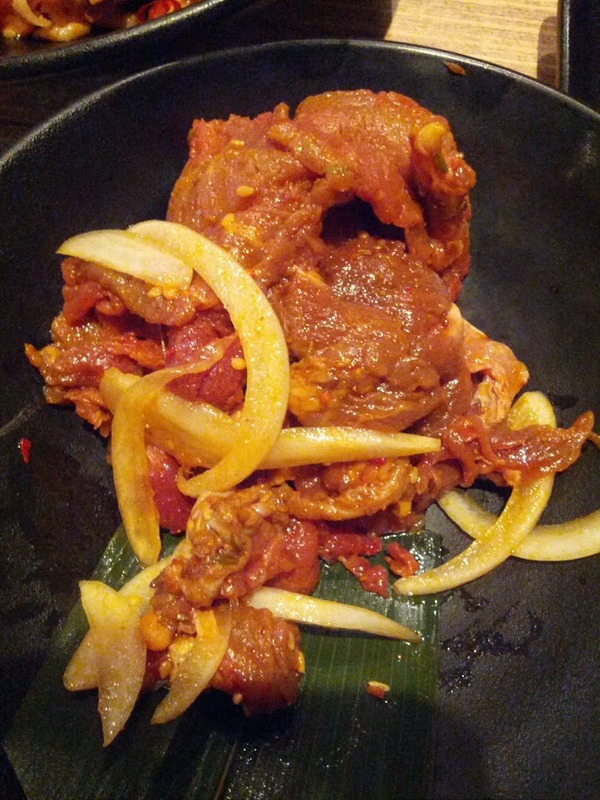 The sauce I usually make from the spices left in the pot after cooking the meat together with some cream. 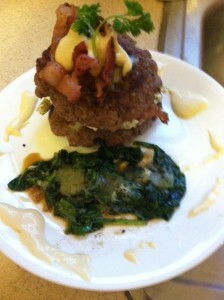 I also sometimes use a Bearnaise sauce together with the meat. Started by cutting the vegetables and having them ready. 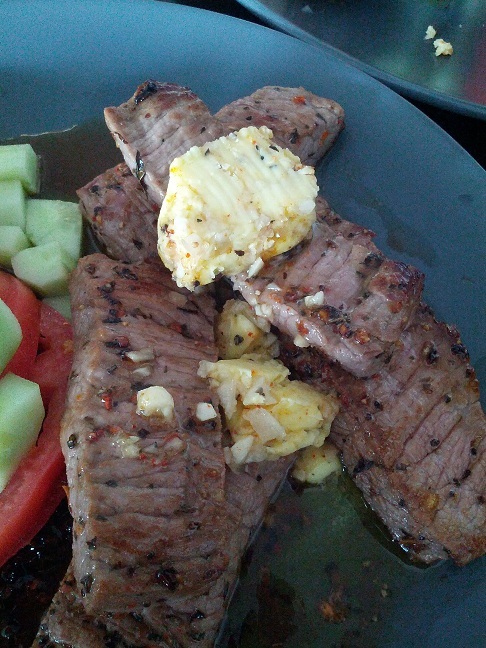 The garlic butter was already ready from yesterdays cooking. Fried the beef together with the usual spices (main focus is on chili pepper). The served everything on the plate as a nice composed lunch. 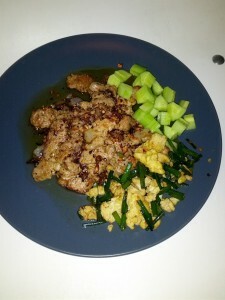 The dinner today was cooked by my wife. 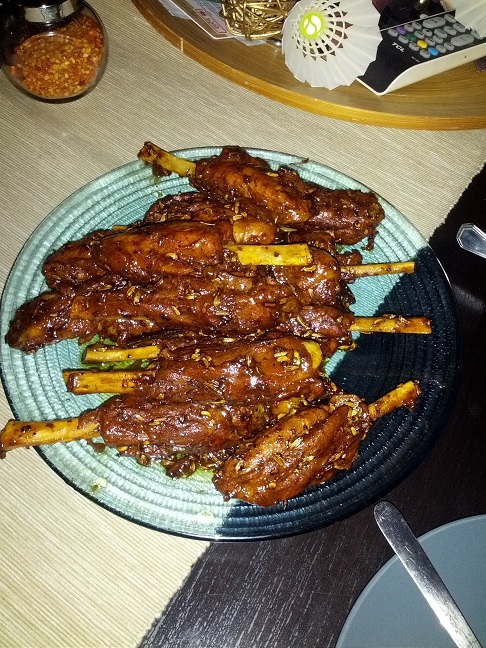 These ribs are one of my favorite dishes. I am not sure about the exact ingredients and most likely a little too much carbohydrates in the spices and sauce they are drenched in but I can afford that since I am usually quite low on carbohydrates. 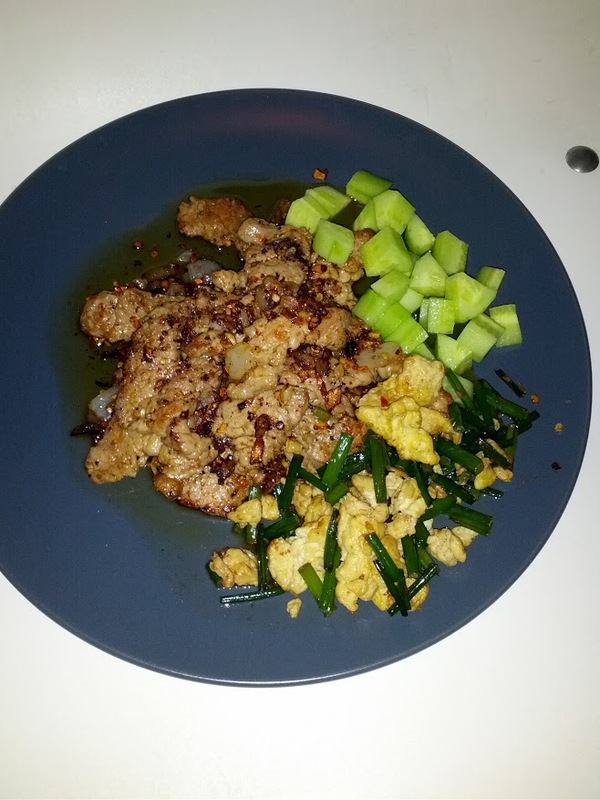 This entry was posted in Food on April 30, 2013 by Johan Bengtsson. Todays food was divided up into 3 different meals. I try to have 2 or 3 meals every day. However it is mainly depending if I am hungry or not. 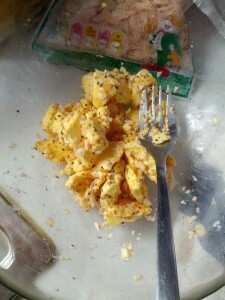 In general i have small meals in the morning since I am usually not hungry when waking up. The days when I go to work I usually only have one egg and 2 cups of normal black coffee as breakfast. Then a little bigger meal during lunch and end the day with another big meal. 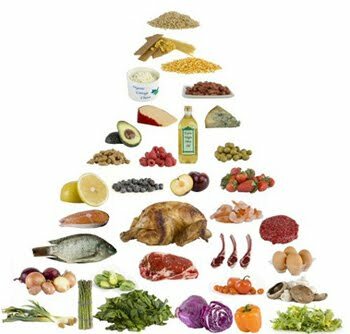 Since I am using a diet that is based on the LCHF diet, Keto and Paleo combination I try to have a low amount of carbs and high amount of fat in my meals. For today since I was not working I started the day off with 2 boiled eggs and 1 big cup of black coffee. Due to not so much food at home me and the wife decided to take a walk to the supermarket and do some shopping before lunch. Ended up with a large amount of meat and some other things. Started off by cutting the meat into smaller pieces. 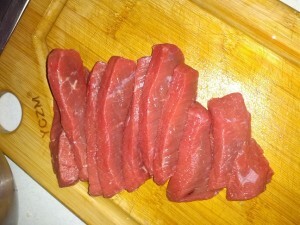 I do this due to that I feel it is easier this way to get the meat the way i want it. I do not want it too red or too well done. Medium is just perfect for me. By cutting to small pieces i can just cook it untill it has a nice color on the sides, and then i know it is done. 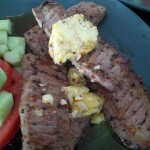 I always cook the meat in both olive oil and butter. I feel it has the best taste when I do like this. Instead of a sauce I today made some garlic butter that I mixed together with 50g butter, half a garlic and then added on salt, pepper and some chili powder. Mix it all together untill it is evenly distributed and then it is ready to be server with the meat. 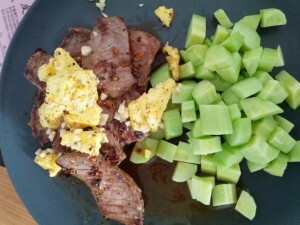 Together with the meat and the garlic butter I also added on some cucumber to have something green on the plate and to also be used as a way to get all that garlic butter up from the plate. 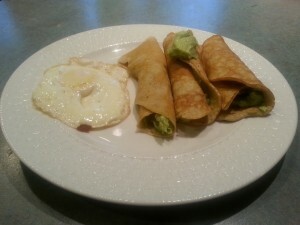 In total this meal had 22% protein, 76% and only 2% carbs which is quite a good combination according to me. Since my wife does not want to be doing the same kind of diet I am going we sometimes need to make food that is more of a compromise. As an example today we cooked a two-part dinner where I only eat one part and she eats both parts. 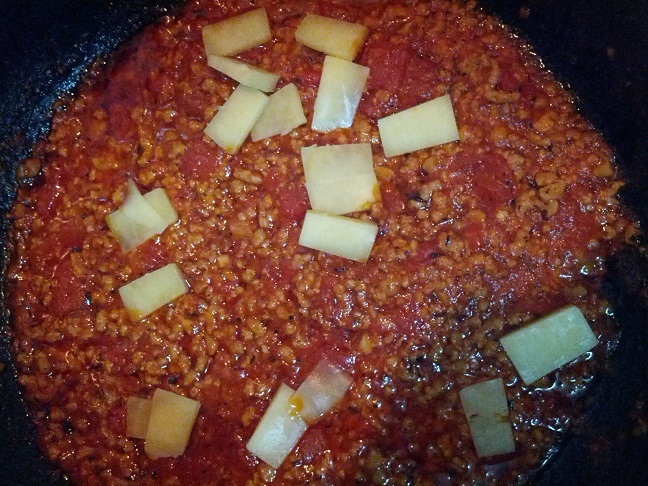 This dinner was a normal spagetti with meatsauce where for my part I just did not have any of the spagetti. Normally I also add onion into the sauce, but forgot to buy some today so I just skipped it. The sauce is cooked by first frying the garlic in the oliveoil and butter. 10-20 seconds is enough if you have high heat on. 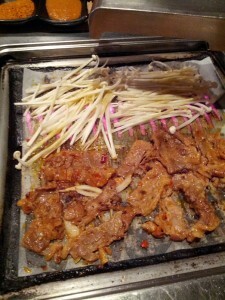 Then you just add the minced pork and fry it all together. Make sure all the minded pork is completely done and then add on the can of smashed tomates. If needed add on some water and let it boil for around 20 minuites. During the cooking make sure you add the spices according to your taste. After the 20 minuites I just spread some cheese on top of it. Ready to eat directly as it is and if your partner want so enjoy it with some spagetti that works just fine. In total this meal had 22% protein, 74% and only 4% carbs which is quite similar to todays lunch. For my LCHF, Keto and Paleo diet I think this is a good combination during a day. Hope you got some good ideas from these two meals. If any questions or comments please leave them in the comments below. I will try to answer as much as possible. 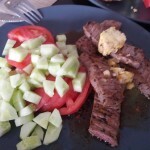 This entry was posted in Food and tagged diet, food, keto, LCHF, Paleo on April 29, 2013 by Johan Bengtsson. 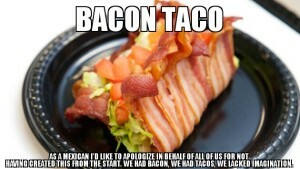 Just found a picture of something called “Bacon Tacos”. Both sounds delicious and looks just amazing. Guess I have to try to make some Bacon Tacos in the near future. This entry was posted in Funny and tagged Bacon, Bacon Taco, Bacon Tacos, Funny food, Tacos on April 25, 2013 by Johan Bengtsson. 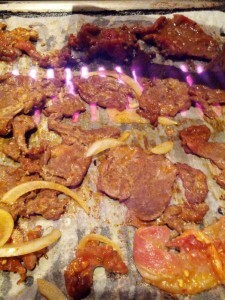 Today went out to have some Korean BBQ for dinner after work. 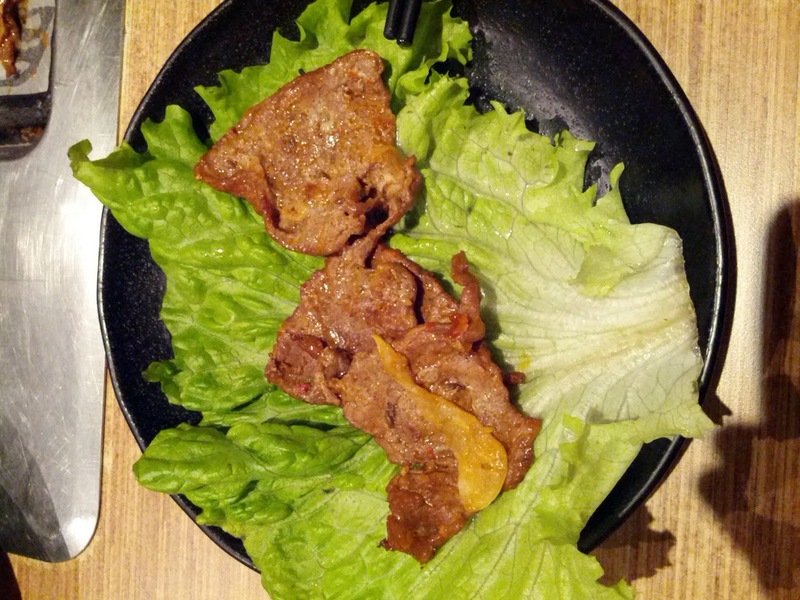 Ended up in a nice Korean BBQ restaurant where we had some nice spicy beef, beef with koriander, lettuce and some mushrooms. In total the bill ended up around $10 for two persons. 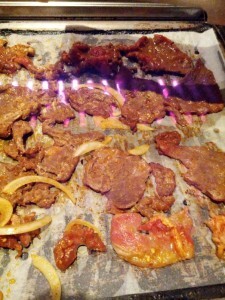 The way to eat it is that you bbq it yourself on the grill that is intergrated into the table. You add spices and salt as you want yourself. 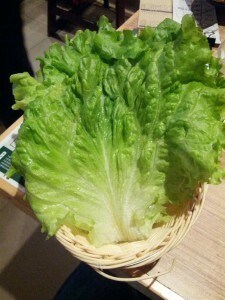 After the meat is finished you simply put it into a piece of lettuce and wrap the lettuce around the meat. Ready to just put into your mouth and enjoy. 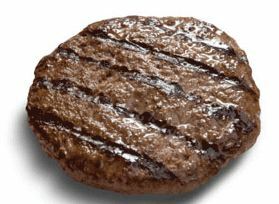 Low on carbs, but not very high on the fat (quite much fat on the beef but probably not enough). 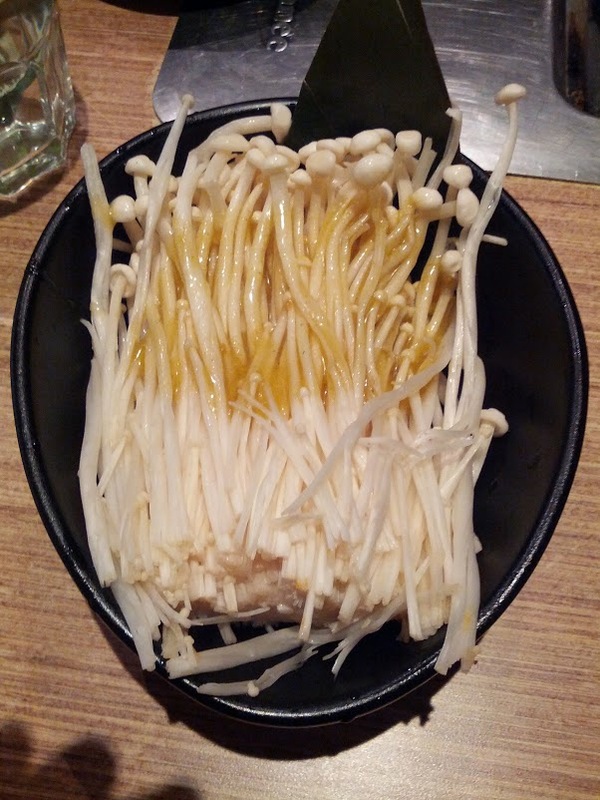 All in all a very good meal and at a good price. Korean BBQ would be even better if there was some nice fat sauce I could add on the meat. 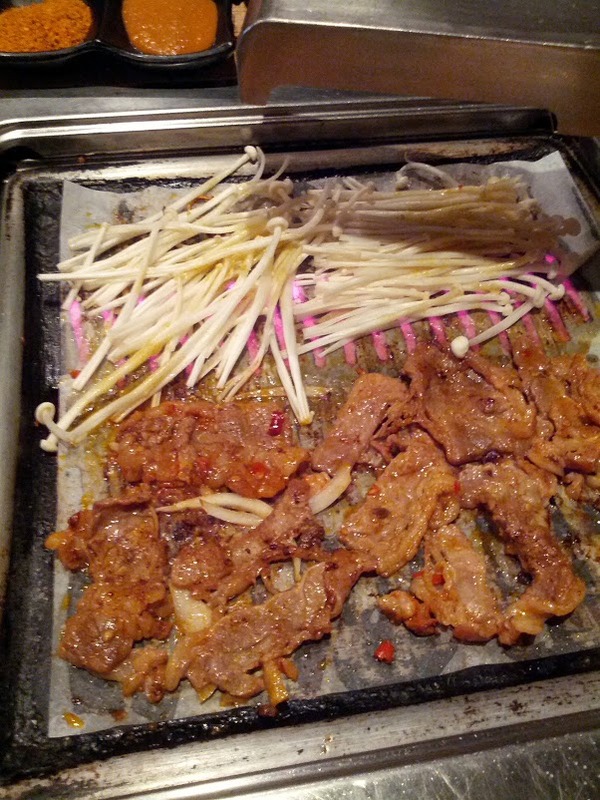 This entry was posted in Food and tagged BBQ, Korean, Lettuce, Mushroom on April 25, 2013 by Johan Bengtsson.